Lombardi: Bond upgrade 'huge news' in face of borrowing Town's union laborers to be promoted on merit Mayor unsure on tax increase; two buildings will bring revenue NORTH PROVIDENCE – The town's latest bond rating upgrade, from the toughest of the big three ratings agencies, is "very, very important" for taxpayers, particu- larly as this community borrows big money to pay off construction of two new schools, says Mayor Charles Lombardi. Moody's Investors Service last week announced an upgrade on the town's debt from A2 to A1, considered the top of three upper medium grades by the agency (followed by high NORTH PROVIDENCE – A pending new contract agreement between Mayor Charles Lombardi and members of the Local 1033 of the Laborers International Union of North America will allow the town to promote dozens of employees based on merit, not solely on seniority. 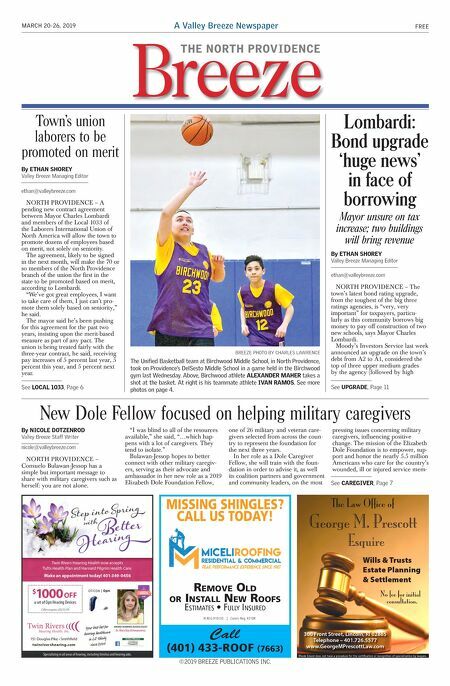 The agreement, likely to be signed in the next month, will make the 70 or so members of the North Providence branch of the union the first in the state to be promoted based on merit, according to Lombardi. "We've got great employees, I want to take care of them, I just can't pro- mote them solely based on seniority," he said. The mayor said he's been pushing for this agreement for the past two years, insisting upon the merit-based measure as part of any pact. The union is being treated fairly with the three-year contract, he said, receiving pay increases of 5 percent last year, 5 percent this year, and 5 percent next year. By ETHAN SHOREY Valley Breeze Managing Editor By ETHAN SHOREY Valley Breeze Managing Editor ethan@valleybreeze.com ethan@valleybreeze.com BREEZE PHOTO BY CHARLES LAWRENCE The Unified Basketball team at Birchwood Middle School, in North Providence, took on Providence's DelSesto Middle School in a game held in the Birchwood gym last Wednesday. Above, Birchwood athlete ALEXANDER MAHER takes a shot at the basket. At right is his teammate athlete IVAN RAMOS. See more photos on page 4. See UPGRADE, Page 11 See LOCAL 1033, Page 6 NORTH PROVIDENCE – Consuelo Bulawan-Jessop has a simple but important message to share with military caregivers such as herself: you are not alone. "I was blind to all of the resources available," she said, "…which hap- pens with a lot of caregivers. They tend to isolate." Bulawan-Jessop hopes to better connect with other military caregiv- ers, serving as their advocate and ambassador in her new role as a 2019 Elizabeth Dole Foundation Fellow, one of 26 military and veteran care- givers selected from across the coun- try to represent the foundation for the next three years. In her role as a Dole Caregiver Fellow, she will train with the foun- dation in order to advise it, as well its coalition partners and government and community leaders, on the most pressing issues concerning military caregivers, influencing positive change. The mission of the Elizabeth Dole Foundation is to empower, sup- port and honor the nearly 5.5 million Americans who care for the country's wounded, ill or injured service mem- New Dole Fellow focused on helping military caregivers By NICOLE DOTZENROD Valley Breeze Staff Writer nicole@valleybreeze.com See CAREGIVER, Page 7 THE NORTH PROVIDENCE ©2019 BREEZE PUBLICATIONS INC. A Valley Breeze Newspaper THE NORTH PROVIDENCE Breeze FREE MARCH 20-26, 2019 Wills & Trusts Estate Planning & Settlement The Law Office of George M. Prescott Esquire Rhode Island does not have a procedure for the certification or recognition of specialization by lawyers. 300 Front Street, Lincoln, RI 02865 Telephone – 401.726.5577 www.GeorgeMPrescottLaw.com No fee for initial consultation. Remove old oR Install new Roofs EstimatEs • Fully insurEd RI REG #10135 | Comm. Reg. #210R Call (401) 433-ROOF (7663) mIssInG sHInGles? Call Us todaY!